The first article I ever wrote was for Chris Kimball's ground-breaking food publication: Cook's Magazine in 1981. I was so delighted when staff writer Albert Stumm, interviewed me for this fun feature in Chris's newest magazine Milk Street. It's a terrific magazine and is the July-August 2018 issue. It is also available with a digital subscription. Is there anything more gratifying than being elevated to the level of the three people (Julia Child, James Beard, and Jacques Pépin) who have had the greatest influence on my career and whom I admire the most? I am deeply honored and grateful to have been chosen as the “icon” baker in Bake from Scratch’s annual Baker’s Dozen, in the company of such esteemed colleagues including two of my dearest friends: Erin McDowell and Umber Ahmad. This issue also has many excellent articles such as Milk Bread and Pizza, with fabulous photos and yes: ingredients are listed in grams. We’ve come a long way! The July/August issue will be on news stands on June 12, and also available on line and on Instagram and Twitter @thebakefeed. Delighted to report that The Baking Bible is #7 in 2016 "best cookbooks" on WikiEzvid.This is a great site which describes the books chosen and links directly to Amazon for purchase. Be sure to check out the video for well thought out details highlighting the best features of each chosen book. Note: pumpernickel flour is actually rye flour, aka rye meal, milled from the entire rye grain, so is the darkest of rye flours. Another Review to Share on "Rose's Heavenly Cakes"
Another very special review and recipe from the book, written by another long time friend, Miriam Rubin, and forwarded to me by a newer dear friend and blogger Matthew Boyer! It's so amazingly interesting to me to see how much of people's personalities are reflected in what they write in a review. And, I must say, I feel very appreciated and am wondering when it will be time to descend from cloud 9! A Very Special Review on "Rose's Heavenly Cakes"
I haven't heard from my old friend Cornelius O'Donnell for many years now but what a way to hear from him now! This was send by another dear old friend, Blake Swihart (whom I always think of as 'sweetheart'. I often listen to a couple of classical music programs on FM radio. And both have hosts that are - to put name on it - gushy. And the delivery of one weekday announced is downright breathless. These guys feel that way about Brahms, Beethoven, and Bach. I feel that way about great food and food writing. So humor me and let me gush it up in describing a new cook book. 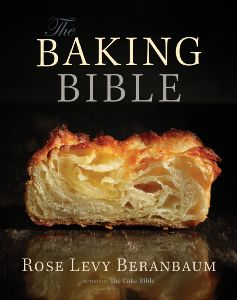 The "Diva" in question is Rose Levy Beranbaum, and anyone who likes to bake, or would like to learn to bake, should run to the bookstore and order most all of Rose's nine books. You may know her first book - The Cake Bible - published in 1988 and named the Cookbook of the Year by the International Association of Food Professionals, a group I once was part of. Then came Christmas Cookies (a James Beard Foundation Award Winner in '98). The indefatigable Rose also produced The Pie and Pastry Bible in 1998. Not content to rest on her laurels, Heavenly Cakes was published last year just in time to qualify for the 2009 book awards. You guessed it; the new book again won the IACP "Book of the Year." And when you pick up a copy it's easy to see why. There is no question that "Heavenly" will join the "Bible" in that pantheon of books that become instant classics. Gush. Gush. I was impressed with the almost four pages of "Acknowledgements," including a photo of her associate Woody Wolston who painstakingly tested and retested the recipes. You really get the sense of confidence in using the recipes. Baking is so rewarding when your creation comes out perfectly. But it's one aspect of cooking that requires precise measurements. A half teaspoon too much or too little and you might have a dud instead of a delight. I like the way the recipes are written and the feeling that Rose is beside you guiding you to perfection. Incidentally for you scientifically minded cooks, ingredients are listed by volume AND weight - in both grams AND ounces. Add the valuable sections on the nuts and bolts of baking: special effects and techniques, ingredients and sources, equipment etc. Gush. But I caution that you'd best have ample counter space or one of those cookbook holders. This is a large format book, heavy enough to be a doorstop, and almost 500 pages long. Have you seen those cake-making competitions on the tube? Zany, improbable, and wobbly-fragile creations are (maybe) fascinating to watch, but get real. What home cooks want - unless I'm nuts - is to produce desserts that are simple, attractive, and most of all tasty. And this is the time of year when cakes can celebrate graduations, anniversaries, birthdays, reunions, and weddings. The book has some stunning and doable wedding cake ideas. None of the Styrofoam layers and plastic pillars for our Rose, eh Hyacinth? Turn the pages of the book and start by reading "Rose's Rules of Cake Baking;" no long treatise, just succinct and practical advice. Then come the recipes divided into sections: Butter and Oil Cakes; Sponge Cakes; Mostly Flourless and Cheesecakes; adorable Baby Cakes; and those wedding cakes. While I was sorely tempted to give you a sample of such delights as the Red Fruit Shortcake in anticipation of our fresh fruit season to come, it is too long for this space. 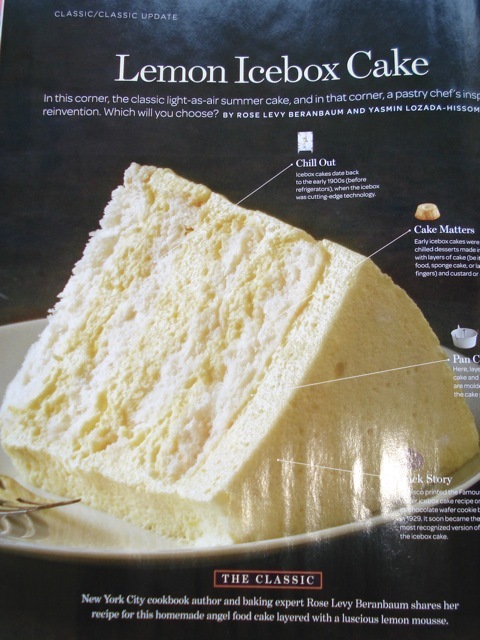 Likewise the No-Bake Whipped Cream Cheesecake, Heavenly Coconut Seduction Cake (a precursor of the wedding cakes, perhaps? ), Lemon Meringue Cake, Chocolate Streusel Coffee Cake, and even the two trifles so beautifully photographed. And while I've made and loved Rose's signature Lemon Poppy Seed Sour-Cream Cake, let's try the Whipped Cream Cake. It's simple, suitable for many occasions, and a perfect foil for a few fresh berries to garnish the plate. In my introduction to The Cake Bible, I wrote about how my master’s thesis research paper, written 34 years ago, on the hypothetical premise: “Sifting Flour Affects the Quality of a Yellow Cake” led me to my future husband (now of 33 years!) and the writing of The Cake Bible.Fellow blogger Hector Wong expressed a strong desire to see this thesis so I dug into my huge supply closet and found the original, copied it, sent it to Hawaii, and Hector kindly digitalized it to share it with all of you who might be interested. If the scientific aspect holds no appeal, do jump to the final two paragraphs of the addendum on bottom of page 35 to see how this paper impacted my life. And I might add that my best advice to fellow writers is to begin a project by looking up the key word in the dictionary. It may well take you in an entirely different direction from what you might have thought. You can download a copy of my master's thesis here as a PDF. The file is fairly large (5.96 MB) and may take awhile to dowload if your connect is slow. if you go on line www.washingtonpost.com you will find a great article on hamburgers with my recipe for the buns.most of you know this, but i just want to emphasize the importance of using unbleached flour when making bread. bleaching destroys protein which means less gluten development. the bread made with bleached flour will spread sideways and have less height and inferior crumb structure. this info is in the link called "tips to bake like an expert." also be sure to click on the link "best buns aren't in a bag" hope you all try these for your memorial day barbecue! To my amazement, the bread made with 100% whole wheat had the aroma of a new-mown lawn combined with freshly cut hay. Kass explained that the bitterness I had experienced was due to rancidity. It was absent in her bread because she used wheat berries ground the same day as baking the bread. A wheat berry can be decades old and if stored properly, will still be viable, the fats in the germ protected from oxidation by the bran, its outer coating. The moment the wheat berry is broken or ground, oxidation starts to take place. Most millers agree that once ground, the flour should be used within 3 days or held for 3 weeks due to certain enzymes that would render it undesirable for bread baking. Three months is the limit for shelf life of the whole wheat flour unless frozen. But for the best flavor, it is ideal to use it the day it is ground. I immediately asked Kass for a few pounds of wheat berries and the day I returned home I started grinding and developing a recipe for 100% whole wheat bread. I discovered that the secret to lightness of the crumb was not only the freshness of the flour but also not allowing the dough to double during rising which tears the more fragile gluten. The result: This soft, moist, slightly chewy, crunchy with walnuts loaf that captures the true nutty-sweet multi-dimensional wheaty flavor of the grain. Note: The average bread made with refined flour has about 66 percent hydration. This bread has almost 88 percent hydration due to the very absorbant bran. It is preferable to weigh the flour as no two flour mills grind the same, which would impact the volume significantly. Equipment: An 8 1/2 inch by 4 1/2 inch loaf pan, greased lightly with cooking spray or oil. A baking stone or baking sheet. In a mixer bowl, place the water, honey, about 2 cups (10 ounces / 286 grams) flour, and 1/2 teaspoon of the yeast. Whisk about 3 minutes until very smooth. In a second bowl, whisk together the remaining flour, vital gluten, and remaining 1/2 teaspoon of yeast. Sprinkle it over the mixture in the first bowl, forming a blanket of flour. Cover tightly with plastic wrap and allow to sit for at least 1 up to 4 hours. The sponge will break through the flour blanket in places after about 1 1/2 hours. With the dough hook mix on low speed (#2 Kitchen Aid) about 1 minute, until the flour is moistened to form a rough dough. Scrape down any bits of dough. Cover the top of the bowl with plastic wrap and allow the dough to rest for 20 minutes. Add the oil and knead the dough on low speed (#2 Kitchen Aid) for 7 minutes, adding the salt after the oil is mixed in. If adding the walnuts, continue kneading 3 minutes. The dough will not be elastic at this point and will not form a ball. It should be sticky enough to cling to your fingers. If it is not at all sticky spray it with a little water and knead it. Place the dough into a 2 quart dough rising container or bowl (3 quarts if adding the walnuts), greased lightly with cooking spray or oil. Press down the dough and lightly spray or oil the top of the dough. Cover the container with a lid, plastic wrap or a damp towel. With a piece of tape, mark where 1 1/2 times the height would be. Allow the dough to rise (ideally at 75°F to 80°F) until 1 1/2 times (no more or it will tear the gluten and result in a dense crumb), about 1 hour. Turn the dough onto a lightly floured counter and press down on it gently to flatten it slightly. It will still be a little sticky but use only as much flour as absolutely necessary. Shape it into a loaf and place in the prepared loaf pan. It will fill the pan to the top. Place it in the proof box or cover it lightly with oiled plastic wrap and allow it to rise until the highest point is about 1 1/2 inches (2 inches if walnuts) above the sides of the pan, and when pressed gently with a finger the depression very slowly fills in—about 45 minutes. 1 hour before baking time preheat the oven to 450F. Quickly but gently set the baking sheet on the hot stone or hot baking sheet and toss 1/2 cup of ice cubes into the pan beneath. Immediately shut the door and lower the temperature to 400°F. Continue baking 45 to 50 minutes or until the bread is golden brown and a skewer inserted in the middle comes out clean. (An instant read thermometer inserted into the center will read about 200°F. Half way through baking, rotate the pan half way around for even baking. Remove the bread from the oven, unmold it from the pan, and transfer to a wire rack to cool completely, top-side up. Wonderful as tea sandwiches with cultured butter, yogurt cheese, bleu-veined cheese and apple slices. o my view, the pastry world is divided between two different personality types: chocolate and vanilla, chocolate reflecting the heavy hitters and vanilla the more subtle and complex. I love both flavors but if I had to chose only one it would be simple: vanilla wins hands down, not only because I love its flavor but because it is one of those rare synergistic ingredients that enhances others. If chocolate is king, then vanilla is queen. And it is indeed the power behind the throne. Where, after all, would chocolate be without vanilla to round out its harsher, coarser characteristics. And in the domain of ice cream, vanilla reigns supreme as our number one flavor. The term plain vanilla is an absurdity. There is nothing plain about magic. Perhaps the concept came about because vanilla sauces and creams are often used as a base for other more intense flavors; but there is nothing plain about it at all. In fact, when it stands on its own as vanilla ice cream or vanilla pound cake, it is the very essence of purity and haunting floral flavor notes that make one yearn for the impossible while feeling utterly fulfilled in the moment. History: Vanilla possesses an intriguing and powerful past going back to the Totonac Indians of the East Central Coastal area of Mexico. Taken as a conquering tribute by the Aztecs, where it was used in a drink called “Chocolatl” in the court of Montezuma, it was next acquired by the explorer Cortez (also written as Cortes) who introduced it to the royal court of Spain in around 1528. In the late 1500s they renamed it “Vainilla” meaning “Little Scabbard,” which the pods resemble. Vanilla was used uniquely for the chocolate drink in Spain for 80 years until 1602 when Hugh Morgan, apothecary to Queen Elizabeth I, suggested using it as a flavoring for other things such as sweet meats and candied fruits. In 1793 the vanilla vine was smuggled from Mexico to the Island of Reunion, then a French protectorate called Ile de Bourbon, hence the term Bourbon vanilla, referring to vanilla grown in this area. Processing: There are some who categorize vanilla as a spice, and as such, it comes second only to saffron as the most expensive one in the world. But to my mind, vanilla is in a category of it own—perhaps more a perfume or an essence than a spice. Vanilla is the fruit of the planifolia (fragrans) orchid or the tahitensis orchid, the only two of 35,000 species of orchid that bears edible fruit (the pompon orchid is used primarily for perfumes and pharmaceuticals). The flower itself is totally devoid of scent, requiring lengthy processing and fermentation to achieve the exquisite aroma of the vanilla bean. Six to nine months after fruiting, the green pods are hand harvested and cured. The curing process begins either by brief soaking in hot water and then rolling in blankets to “sweat,” or, as is done in Mexico, by wrapping in blankets and then straw mats and heating the beans in an oven for 24 to 48 hours. In either case, the curing continues over a period of 5 to 6 months, during which the pods are sun dried each day and then returned to the sweating blankets at night. When fully cured, the pods are fermented, shrunk to one-fifth their original weight, to become characteristically dark brown and wrinkled and are referred to as vanilla beans. Incidentally, there is some confusion as to the use of the word vanilla bean because when the seeds (sometimes referred to as grains) contained in the pod are used in a product it is usually referred to as vanilla bean (ice cream or crème bruleée for ex.) even though only the seeds are used and not necessarily any of the pod. A vanilla bean is actually the entire pod containing the seeds. The average vanilla bean contains 60,000 seeds. Madagascar beans graded “Prime Triple A’s,” however are left on the vine an extra week and grow to as long as 8 3/4-inches) containing 90,000 seeds. These represent a little less than 2% of the crop. Vanilla grows best in areas 10 to 20 degrees north or south of the equator in a hot moist tropical climate with year round temperatures of 75 to 85 degrees F. Primary produces of vanilla are Indonesia, Mexico, Tonga, Tahiti and the Bourbon Islands including Madagascar which is said to be the finest from this area which produces about 55% of the world’s annual supply of 1700 tons. Vanilla beans vary enormously in quality. In generally, the best beans are thought to come from Tahiti, Madagascar and Mexico, though Indonesia also produces some beans of very high quality with slightly smoky notes. Gahara, which means “of royal descent,” is the most highly regarded Indonesian vanilla, coming from Bali in the Batubulan province, imported by Paris Gourmet. According to the late Chat Nielsen Jr. of Nielsen Massey, the Madagascar “Bourbon” has a full rich creamy flavor, Mexican vanilla slightly spice like clove or nutmeg, Reunion vanilla also possesses a slightly sweet spicy note, and Comores vanilla has a balsamic quality. His son, Craig Nielsen says his personal favorite is Madagascar for its “deep rich complex, classic vanilla taste. Tahitian is floral and fragrant but the flavor profile is one dimensional.” His take on Mexican vanilla is that it is virtually indistinguishable from Bourbon when added to other ingredients. Mexican vanilla fell into disfavor for a while because some unscrupulous producers were adding coumarin (an irreversible blood thinner) as a flavor enhancer. According to Zarella Martinez, successful efforts are now being made to produce organic first class vanilla in Papantla, the vanilla native region, by growers like Victor Vallejo and processors such as Heriberto Larios and Cesar Arellano. An organization has been formed (La Asociacion de Vainilleros de Papantla) and they have instituted rigid controls as to when the vanilla can be harvested. In addition only a few orchids are pollinated on each plant so that the beans that do grow are first rate. The term “fold” refers to the strength of the vanilla extract, not the flavor. The FDA defines single strength (one-fold) as being made from 13.35 ounces of vanilla beans (about 100 beans) which contain less than 25% moisture, per gallon of liquid solvent. Specialty producers claim that their single strength is 10% stronger than most supermarket brands. Double strength (2 fold) uses two times the amount of vanilla bean per gallon of liquid solvent, triple strength 3 times, quadruple strength is 4 times after which it becomes supersaturated. Thirty folds is the highest concentration produced. In order to get to 10 fold concentration, 10 gallons of a 1 fold vanilla are put into a still and under pressure and vacuum the water and alcohol is drawn off, and it is reduced to 1 gallon of 10 fold. This concentration process also drives off flavor components so if reconstituted to 10 gallons it would not be the same. It is used in industry for convenience when working with large quantities of product. La Cuisine, in Alexandria Virginia, offers a highly aromatic 8 fold Madagascar extract for which the beans have been flash frozen before extraction presumably to maintain freshness and quality. According to the FDA, vanilla labeled “pure vanilla extract” must contain at least 35% alcohol. (This is not to say that vanilla extracted in mediums other than alcohol is less “pure,” and may in fact be superior!) It may also contain vanilla seeds and ground pods. Sugar, dextrose and cornsyrup, coloring and preservatives are permissible but must be listed. According to Patricia Rain, in her “Vanilla Cookbook”, Celestial Arts Berkeley, Ca. 1986, manufacturers may use 5% to as much as 40% sugar to speed up the aging or mellowing process. Sugar is also used to prevent a muddy color but if caramelized sugar is used it will produce a dark, often muddy color. Liquid vanilla extract is designated as a flavoring by the FDA when it contains less than 35% alcohol. You can have a pure vanilla flavoring that is less but it is not designated as an extract. Some manufacturers such as Euro Vanille refer to their product as “Pure Vanilla Extract” though they cannot technically have the FDA designation since it contains no alcohol. In this case, the vanilla is extracted either in alcohol or in carbon dioxide and this medium is then replaced by a glycerin medium, a more neutral propylene glycol medium, or an invert sugar. These varieties of vanilla are used in industry or by individuals who desire the flavor of natural vanilla without using the whole bean or an alcohol solvent. Because glycerin is a vegetable oil derivative, with a higher evaporation point, it dissipates less during baking than a vanilla in an alcohol base. I find that glycerin, when tasted alone has a distinctly bitter taste though in minute quantities and added to other ingredients this may not be perceptible. Euro Vanille and Searome both use the inverted sugar to eliminate any bitter aftertaste. The now ubiquitous vanilla paste usually contains natural vegetable gum such as carogene for viscosity so it is thickened but still fluid enough to pour. The paste also may contain either the seeds and/or the pod, and sometimes a small amount of vanilla extract in alcohol or sugar syrup. Paris Gourmet imports a Gahara (Indonesian) vanilla paste made from the entire bean in an alcohol, water and emulsifier medium. This is offered as a more economical approach as the beans used are not of the same quality, resulting in less purity and flavor depth. Nielsen Massey and Mr. Recipe, however, use the same quality beans in his paste but not the pod because it sometimes will add bitterness. Isaacson claims that chefs prefer the paste or the essence to extract and produces extract for the consumer only because recipes call for that product. The vanilla bean seeds add a subtle earthy depth of flavor and unique sweet quality, but the bean alone cannot offer the full depth of flavor. The extract, though easier to use, lacks the sweet roundness and in excess may even impart a bitter edge, hence the popularity of the vanilla pastes which offer a balance of complexity, richness and fullness of flavor. Vanilla paste, however, is not as strong as extract because it is not full strength or full extraction. It is, therefore, somewhat of a compromise. The ideal flavor profile would be a combination of extract and seeds, and second to that paste, and seeds. Pure vanilla is also marketed in the form of a powdered bean, and also powdered with sugar. Though most of the flavor resides in the seeds, when the entire pod is used the resulting powder is coarser than the seeds alone and the flavor less subtle and delicate, delivering far more flavor impact but less depth of flavor than extract. Euro Vanille markets a powder that is 100% vanilla, using the bean and the seeds. Nielsen Massey’s vanilla powder has been encapsulated onto a maltodextrin (modified cornstarch) as opposed to the more usual dextrose base which is much sweeter. The FDA allows allows pure vanilla powder to contain lactose, food starch, dried corn syrup, acacia, and an anticaking ingredients. To sum it up: The major advantages of vanilla paste, vanilla bean seeds and vanilla powder over extract is that more can be used without resulting in bitterness, and that the flavor does not dissipate during cooking or baking. The major advantage of extract is richness and intensity of flavor and ease of disbursement in a liquid medium. Aaron Isaacson advises using paste in recipes that are not subjected to high heat, in conjunction with extra seeds to give the extra flavor boost that you would not have with just the bean alone. He says that the extra sugar in the paste also brings out more vanilla flavor, making it more complex, richer, more mellow and rounded. He advises using the essence or extract in combination with the bean for long baking such as cakes and crème brulée, because it is richer and more full bodied. Though some of it dissipates, there is still an uderlying flavor carried by the alcohol. Incidentally, most vanilla products are designated as kosher (the designation appearing on the packaging). Appearance: A vanilla bean should be dark brown, plump, glossy or oily, and flexible. It’s surface can display white vanillin crystals. If you look very carefully, you may even find a distinctive mark on a vanilla bean. Some growers actually brand each bean to prevent theft during processing! The average bean measures 5 to 6-inches in length but some measure almost 8 ¾” in length, depending on variety. Those that are the ripest will tend to split sharply along their length. Sometimes you will notice a white substance coating the vanilla beans. This is usually not mold, it is most probably flavorful natural vanillin crystals which migrate to the surface. (Some disreputable producers harvest this vanillin for other purposes, lowering the quality of the bean. According to Chris Broberg, beans still containing all their vanillin smell sweeter. He recommends always getting an analysis. To determine whether the white substance is mold or vanillin, simply touch your finger to the bean. If it is mold it will not disappear but if it is vanillin crystals, after a few seconds they will vanish. Taste: The best way to taste and compare vanilla is in bottled water or club soda sweetened with a simple syrup made by bringing 3/4 cup water and 1 1/2 cups sugar almost to a boil, stirring constantly until dissolved, held at that temperature for a few minutes stirring, then cooled to room temperature. Use about 1 quart of club soda to 6 1/2 tablespooons simple syrup to 1 tablespoon of vanilla. If the vanilla is of a higher concentration or fold, use proportionately less . For the vanilla bean, use 1 bean per cup of water/syrup mixture. Split the bean down the center and cut it into 1/8 to 1/4-inch pieces. Steep for about 2 hours. A plain butter cookie is also an excellent way to assess the baking qualities of vanilla. Storage: Vanilla extract or paste is thought to improve on age, developing nuances, for perhaps as long as 5 years and even longer if stored under ideal conditions. If stored at too cool a temperature flavoring material may precipitate out requiring shaking before use. The ideal temperature for both extract, paste, and beans is 70 to 80°F. at low humidity, and not exposed to light. A plastic bottle or for the beans, a freezer weight airtight bag is preferable to glass which is porous. Beans stored in this manner will keep their freshness for up to 6 months. If vacuum packed they will stay fresh even longer. According to manufacturers, chilling or freezing destroys some of the esthers and flavor components. When using any variety of vanilla bean in a sweet recipe I prefer to scrape the seeds into the sugar and process the two together to distribute them evenly. This is particularly important with Tahitian beans which are plumper than the others and the seeds far more pulpy. It is recommended, whenever possible, to add the vanilla at the end of the recipe because heating changes the entire chemical nature of vanilla. Shirley Corriher, author of “CookWise,” when asked if there is a southern traditional use for vanilla replied unhesitatingly: Yes; we put vanilla in everything sweet. Zarella Martinez, of Zarella’s, has perfected a Veracruzian chicken dish called “Pollo en Chile Seco, Vanilla and Orange,” and says “the vanilla bean rounds out the flavor and gives it dimension.” Christian Delouvrier, of Lespinasse, finds that vanilla makes the meat or fish sweeter. One of his favorite uses is with lemon cured in salt in a sauce for foie gras. In industry, vanilla is used in soft drinks, Coca Cola being one of the major importers of Mexican vanilla. It is also used in perfumes, pharmaceuticals, cosmetics and tobacco. Chris Broberg, of Petrossian, reports having enjoyed an inexpensive cigar that had been stored with vanilla beans which imparted a sweet quality, particularly in the aroma. Jonathan Zearfoss, culinary professor at the FCI, in a class on aphrodisiacs offers a recipe for vanilla bean infused mineral oil to be used as a perfume. In Mexico, whimsical vanilla bean sculptures in the shape of roses, frogs, etc. are used as room deodorizers and a vanilla bean can even be found underneath the seat of taxi cabs. Note, a drop of vanilla applied to a light bulb before turning on the light also works well as a room deodorizer. How to Use Left Over Pods: Vanilla beans still have lots of flavor even after the seeds have been removed. Be sure to rinse the bean if it has been used to flavor another liquid and dry it in a low oven or with the heat of the oven's pilot light. The most time-honored use for left over vanilla pods is to make vanilla sugar by burying the dried pods in the sugar. Pastry Chef Jean Philippe Maury of the Bellagio in Las Vegas, recommends substituting this sugar for 8 percent of the weight of the sugar used in a recipe. Jacque Pfeiffer uses equal parts vanilla bean and powdered sugar to pulverize into a powder. Aaron Isaacson pulverizes the pod with sugar and triple sifts it to get rid of any extraneous matter that would cause bitterness. He uses this to replace as much as 30 percent of the sugar in cakes. He feels it is imperative to use vanilla sugar in cookies as with other forms of vanilla the flavor will to some to some degree bake out, however also adds some extract or essence for the additional flavor profile. For years I have added some of my spent vanilla beans to vanilla extract, a precursor to the now ubiquitous vanilla pastes. Chocolate has had its day in the sun and is clearly here to stay, but now there seems to be a gradually swelling trend toward vanilla awareness, exemplified by the variety of the bean used often appearing on dessert menus. Vanilla, traditionally a supporting player, is well on its way to stealing the show, possibly leaving chocolate in the cocoa dust. Jean Francois Bonnet, of Cello, prefers Madagascar, in particular the Euro Vanille, because he finds Tahitian too strong but agrees that it works well with assertive tropical flavors such as passion. Chris Broberg, of Petrossian, prefers Mexican, saying it is not as cloying as Tahitian, nor slightly fermented like Madagascar, nor smoky like Indonesian. He infuses it in syrups to flavor fruit and jams. Phillips Conticini, of Petrossian, likes the texture of Madagascar grains though he appreciates the flavor of Tahitian as well. Francois Payard, of Payard, prefers the Madagascar. Claudia Fleming, of Grammercy Tavern, says we overlook this most precious of essences. She feels that vanilla has been neglected and pushed aside because of the trendy things being done and would like to resurrect it. She is serving a baked warm chocolate chiboust, with vanilla ice cream, using the bean and extract which boosts the flavor, with a vanilla bourbon sauce. Johnnie Iuzzini, of Daniel, finds Madagascar richer and sweeter than Tahitian which he feels is more aromatic but less flavorful. He says that vanilla can stand on its own but complements and rounds out a lot of desserts—things you want to keep simple yet add a little flavor. He uses vanilla with fresh fruits such as a fruit soup with melon and a little elderflower water, or in a fresh cream to give it a ripe non-processed flavor. He likes vanilla in invert sugar from Sevarome as it incorporates easily into other things but employs vanilla bean ground with sugar in tarts, sifted to take out any chunks. Emily Lucetti, of Farralon, uses Tahitian in ice cream and panaccota where it is the main flavor and Madagascar (due to the greater expense of the Tahitian) in applications where it is more masks by other flavors She says it used to be an accent flavor and now is a primary flavor and has emerged in its own right. Nancy Oakes, of Boulevard, adds vanilla to her brining liquid for meat. Francois Payard, of Payard, says that vanilla is a very interesting product that can be adapted to a lot of different desserts and the flavor changes depending on what you put it with. Andrew Schotts, of Ghiradelli Chocolate, has a favorite recipe for sea bass with veal stock and vanilla. Jean George Vongerichten, of Jean George, prefers Mexican partially because he feels it is fresher and therefore more flavorful. He uses it in many of his savory recipes. Bill Yosses, of Citarella, prefers Madagascar because it has more seeds, and the flavor is more concentrated and pungent, compared to the Tahitian which is more rounded, mellow and floral. He says he has always been attracted to vanilla as a central element of a dessert and that it is so often used as an “accent,” it must be tired of singing in the chorus. He is doing an all vanilla plate called “vanilla decadence” to include a warm vanilla cake with 12 bean vanilla sorbet (12 beans per quart!) He also uses it in fruit marinades with tropical fruits such as mango and pineapple, and tropical fruit skewers with vanilla and réglisse marinade and kalamansi dipping sauce. i'll update this blog entry with the current list of books that have recipes that i've writtenREVISION: I have updated "The Cake Bible" for the first time since its publication almost 17 years ago. The update includes new chocolate information, the new types of yeast, and new sources for ingredients and equipment. Look for copies that indicate the revision on the cover. "Mom's Secret Recipe File," pub date Mother's Day 2004, contributed 3 recipes Fine Cooking Magazine issue 65, June/July 2004 "How to Make a Lattice Pie (with a wonderful new flaky, tender, and delicious pie crust and step-by-step photos on the making of the lattice so that even someone who has never made one before will see how easy it is) "What Do Women Really Want: vol.1 Chocolate," by Donna Barstow, pub date May 2004, contributed the foreword. "Food & Wine An Entire Year of Recipes 2004," page 333, contributed Christmas Sugar Cookies from "Rose's Christmas Cookies." Food & Wine "Best of the Best the best recipes from the 25 best cookbooks of the year," pages 56 through 67 (from "The Bread Bible.") "On Cooking a Textbook of Culinary Fundamentals, Fourth Edition, Pearson Prentice Hall, page 1078, excerpt from "The Cake Bble.